Tonight I had my first ever meet-up with a blog reader! Hannah emailed me after realizing that I work down the street from where she lives and while we originally planned to grab lunch one day, our schedules got mixed up and we ended up grabbing dinner instead. 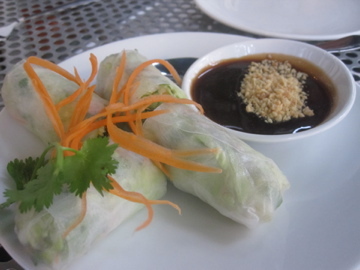 The spot of choice was Little Saigon in St. Louis’ Central West End area. I’d never been but Hannah suggested it and I am a huge fan of Asian food. Hannah just graduated and is looking for a job working with a non-profit in either New York City or Boston. She has an impressive resume, so of you guys know of anything, let me know!! We chatted nonstop about running (she runs crazy distances Skinny Runner style), our parents being doctors, and growing up in St. Louis. It’s crazy how much we had in common, but I guess that’s to be expected with two people that love healthy living blogs. Hannah and I shot each other a quick glance and then said in unison “soft!”. These were perfectly light and fresh and the dipping sauce was thick and sweet. Note: Hannah is much better at using chopsticks than I am. 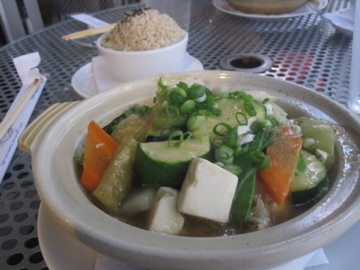 For our meals, we both ordered the “Rau Chay Ðau Hu Nau: Tofu, Snow Peas, Taro Stalks, Mushrooms, and Napa Cabbage cooked in Clay Pot and Served with Jasmine or Brown Rice”. The waiter asked us “jasmine or brown rice?”, and without missing a beat we answered “brown!” Gotta love it. This big bowl of steamed tofu and vegetables in a lightly salty broth was my heaven – any time someone puts a big bowl of veggies in front of me I’m a happy camper! And Hannah thought to ask for some sriracha because she’s a genius. I mixed a big spoonful of the brown rice into my bowl and proceeded to devour. My chopstick skills got a little better as I picked up the big chunks of perfectly cooked vegetables. I really enjoyed the dish and would definitely order it again. It’s the type of meal that feels special while still being healthy and light. We both managed to finish our bowls, which is surprising considering we the amount of talking going on! 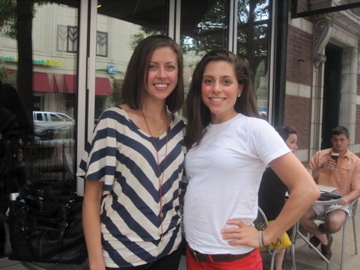 It was so great to meet Hannah and get to try a new restaurant at the same time. I’m sad that I’m moving soon and won’t get to hang out with her much, but with luck she’ll be heading to the East Coast soon too. Thanks, Hannah, for a fun night! I have to be up early for a volunteer project tomorrow, so probably won’t do anything big tonight. Except I might go to fro-yo by myself and that’s always a big deal. Have a great night!! Bloggers – have you ever met one of your readers before? Readers – have you ever reached out and set up a meeting with one of your favorite bloggers? Do it! ← St. Louis Blogger Meet Up! That dinner looks amazing! 🙂 I love Asian food so much! I haven’t ever met any other bloggers but I think it would be so fun to do! Those dishes look so great! I’d love to meet up with another blogger, but I haven’t stumbled upon any from central Indiana yet! Also, I asked you this on twitter but I don’t think you ever saw it: Do you always go to bikram on a completely empty stomach, or do you eat something light before? I’m trying to figure the whole bikram thing out at the moment! I’ve never had a blogger/reader meet up but I want to!! That’s awesome they serve brown rice. I wish all my favorite Aisan places would! Y’all be crazy sitting outside though! ooo ive never met a reader!! thats so cool! so sweet of you and her! I’ve never met a reader before, but I would love too! Sounds like you had an awesome night and that veggie bowl looks awesome 🙂 Summer rolls are my favorite, since they’re so light and refreshing, plus the dips are always amazing! ah, i’m glad you got to meet a blogger/reader! it’s so much fun! i’ve met lots and lots of bloggers and readers; it’s exciting and like i’ve known them without ever really meeting them!